This week the BBC news channel offered to its audience one of the oddest interviews ever done before. It was a London city trader called Alessio Rastani, who declared, among other things, “Goldman Sach rules the world”, the end of the euro and that many people would lose their savings in the next twelve months. “This crisis is a dream come true for those who want to make money. I’ve been dreaming about this for three years. I have something to confess: when I go to bed every night I dream of another recession”, declared Rastani in his only-three-minutes interview. It have been suggested by made Reuters, Forbes and even Twitter, the idea about this English broker was a fake plotted by one group of activist, the so-called Yes Men due to his such a controversial statements. The English broadcaster knows them well . Coinciding with the anniversary of the Bhopal disaster -where nearly 9,000 people were killed-, Yes Men deceived the British broadcaster posing as spokesmen for Dow Chemical in the case of Bhopal. At this point, the company recognized the damage caused and promised to compensate the victims for $ 12 billion. But it was a hoax of course. Then .. who are Yes Men actually?. Based on the culture-jamming, this duo of activists formed by Andy Bichlbaum and Mike Bonanno, created the Yes Men. They use something known as “tactical media”, a term coined in 1997 which consists of a kind of activism where the aim is impact on the media through hit-and-run interventions in the media and the creation of permanent and alternative media outlets. Besides the Yes Men, this method is used by other groups such as RTMark -who offers a reward to any journalist or producer who invites an impostor to their TV programe to representate the WTO- or the Electronic Disturbance Theater. According Wikipedia, “Tactical media projects are often a mix between art and activism”, which explains why many of its roots can be traced to various art movements such as dada and surrealism. Their aim is to raise awareness about what they consider problematic social issues. In the Yes Men case, they mimic their subject through certain mediums. Examples include counterfeiting sites and creating fake videos. They will mimic their criticized subject, designed to fool the general public into believing their alternate identity. Examples of organizations and corporations that The Yes Men have successfully impersonated (and criticized) are Dow Chemicals, ExxonMobil, Shell, BMW, McDonald’s, World Trade Organization, U.S. Department of Housing and Urban Development (HUD), The New York Times and Heritage and so on. This amazing couple have filmed two documentaries. The first, The Yes Men, released in 2003, was shown on international movie festivals as Sundance, Berlin and Toronto and the winner of the first prize on the US Comedy Arts Festival. In this humorous video spoof they are posing two delegates in a WTO summit, asking corporations to buy votes directly from the general public. This has been considered, not only a funny stuff but a “defense of freedom” within a globalization time. The second one, released in 2009, is The Yes Men Fix the World where a lot of tactical media activities are collected. One of them, when in 2009 the Yes Men spoofed the United States Chamber of Commerce, declaring a U-turn on their climate change policy. Major TV and newspapers carried this story briefly before the hoax was uncovered. Another when they replaced the ExxonMobil CEO, Lee Raymond, during Canada’s largest oil conference in Calgary, Alberta (2207). 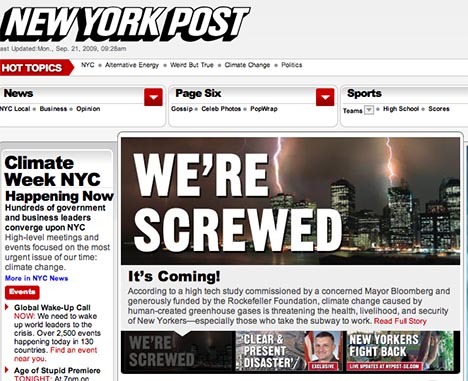 And finally, when two thousand of volunteers distributed throughout New York, the day before the United Nations Climate Change Conference in 2009, a 32-page -special edition New York Post with the cover story “We’re Screwed”, warning the city could face deadly heat waves, extreme flooding, and other lethal effects of global warming within the next few decades. The paper has been created by the Yes Men and a coalition of activists as a wake-up call to action on climate change. In both films, they impersonate entities that they dislike, in a practice that they call “identity correction” which is aimed to “impersonating big-time criminals in order to publicly humiliate them. Our targets are leaders and big corporations who put profits ahead of everything else”, highlight the group. The Yes Men operate under the mission statement of telling the truth and exposing lies under the belief that corporations and governmental organizations often act in dehumanizing ways toward the public. They create and maintain fake websites similar to ones they intend to spoof, which have led to numerous interview, conference, and TV talk show invitations. Eva’s Apple: is GM food the forbidden fruit?